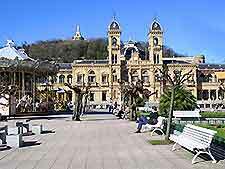 Many major landmarks are present in San Sebastian, with numerous historic buildings in the very heart of San Sebastian, such as the late 19th-century City Hall (Ayuntamiento) and the Municipal Library (Biblioteca Municipal). One of San Sebastian's most famous landmarks, the Castle of the Holy Cross (Castillo de Santa Cruz de la Mota) stands high above San Sebastian and offers spectacular views of the surrounding area. 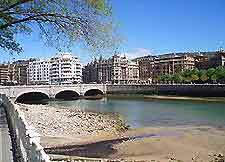 An important landmark in its own right, the Port Walls (Murallas del Puerto) offer an insight into San Sebastian's past, while the early 20th-century Courts of Law (Palacio de Justicia) featuring a simply breathtaking façade. 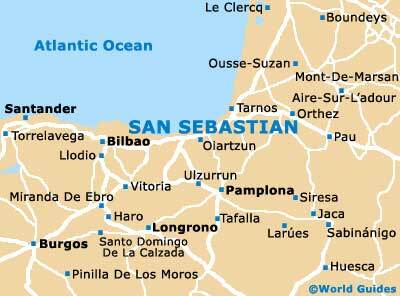 Standing in the Historic Quarter, San Sebastian City Hall, known locally as the Ayuntamiento, dates back to the 1880s. Original built as a casino, the Ayuntamiento features elaborate sandstone architecture, with many period features, an ornate interior and large function rooms. San Sebastian City Hall is one of the area's main landmarks and is situated close to La Concha Bay. Previously the old City Hall (Ayuntamiento), this notable landmark building was opened in the early 1830s and stands in the spacious Plaza de la Constitución. With classical stone architecture and many intricate carvings, the building is now home to the Municipal Library, which houses an enormous collection of books, maps, important documents and local artefacts. An eye-catching and stylish bridge built in the early 1920s, the Puente de la Zurriola is a concrete-based bridge, close to the city centre. One of the main features of this stylish landmark are the lamps, with line either side of the bridge. 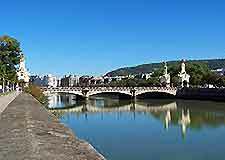 A modern bridge in central San Sebastian, Maria Cristina Bridge was built at the turn of the 20th century and features stylish architecture, incorporating concrete and iron. 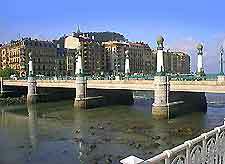 With three arches and ornate iron work, the Puente de Maria Cristina is an important crossing point and spans the Urumea River. The most historic bridge in San Sebastian, Santa Catalina Bridge dates back to the 1870s and has been renovated and restored many times over the years, with grand stone archways. With origins more than 800 years ago, the Castle of the Holy Cross is a historic fortress standing high above the surrounding area, and offers superb panoramic views. Much of the castle has been restructured and rebuilt over the years, and has played an important part in the city's defence during past conflicts. The 16th-century remains of the wide stone Port Walls are an important reminder of the imposing landmark, which once surrounded much of central San Sebastian. This lasting section of the city's Murallas del Puerto stands in the Mount Urgull area and features a gateway known as the 'Portaletas'. 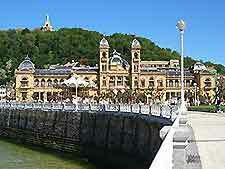 San Sebastian's Courts of Law are housed in a spectacular building of epic proportions. Situated in the city centre, in the Ensanche area of the city, the Palacio de Justicia dates back to the early 1900s and was built using the lasted building techniques at the time, with a classical stone façade, striking columns and a particularly grand entrance hall. A beautiful building in Gipuzkoa Square, the Delegation Palace features traditional Spanish architecture, with grand lower archways and detailed features. Completed in the mid-1880s, the Palacio de la Diputación suffered considerable fire damage soon after, meaning that much of the palace needed to be rebuilt.